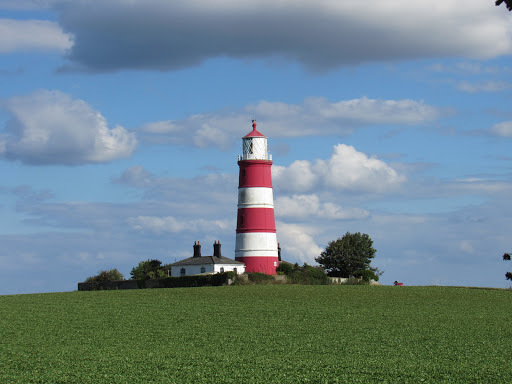 Slightly Hopperesque view of the lighthouse at Happisburgh (pronounced ‘Hazeborough’), Norfolk. Human footprints dating to between one million and 780,000 years old have been reported on the beach of the coastal village of Happisburgh, Norfolk (pronounced ‘Hazeborough’), and are the earliest-known direct evidence for the presence of humans in northern Europe. The footprints briefly emerged at low tide in May 2013, having being exposed by rough seas. Within a fortnight, they had vanished again – but not before a team led by Nick Ashton from the British Museum had obtained plaster casts and 3d images. A total of 152 footprints were recorded, of which twelve yielded complete outlines suitable for analysis. It is thought that these twelve footprints represented five individuals ranging in height from 0.93 to 1.73 m (3 ft. 0 in. to 5 ft. 8 in. ), suggesting the presence of both adults and children. It has been suggested that the Happisburgh hominins are related to Homo antecessor (‘Pioneer man’), a human species known from Sierra de Atapuerca in northern Spain during the period between 1.2 million and 800,000 years ago (Ashton, et al., 2014). Early humans from this period are broadly categorised as Homo erectus. In Europe, Homo erectus was later replaced by the larger-brained Homo heidelbergensis, which might have been the forerunner of the Neanderthals in Europe and modern humans in Africa. The Happisburgh footprints are the earliest direct evidence for humans in Britain, but tools used by these first Britons have been coming to light since 2005, when 700,000-year-old flint artefacts were reported from Pakefield in Suffolk (Parfitt, et al., 2005). 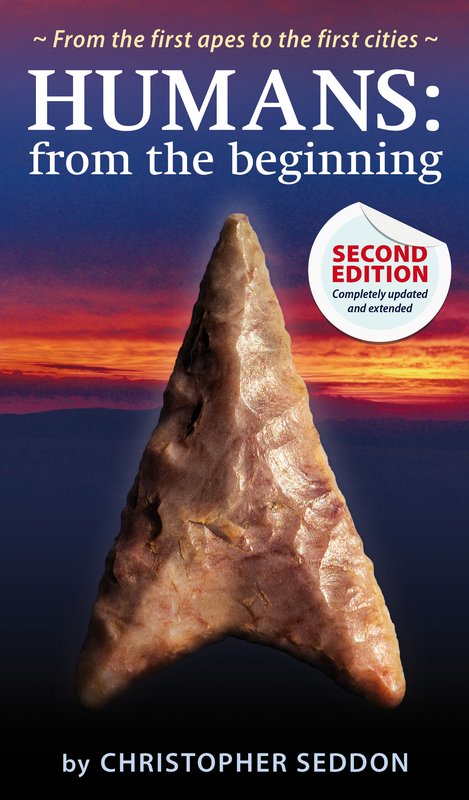 In 2010 even earlier flint artefacts were reported from Happisburgh, estimated to be at least 780,000 years old, and probably older (Parfitt, et al., 2010). Previously, the earliest uncontested evidence for humans in northern Europe dated to no earlier than around 500,000 years ago (Parfitt, et al., 2005). Analysis of animal remains suggests the Happisburgh people occupied the edges of forests at what was then an estuary of the River Thames, and lived towards the end of a warm interglacial period. It is not certain when the interglacial occurred, but there were warm periods from 866,000 to 814,000 years ago, and from 970,000 to 936,000 years ago (Parfitt, et al., 2010). Britain was at this time connected to the mainland and lying on the southern edge of the forests of northwestern Europe. The climate was similar to that of today and while comfortable by British standards, it would have been chilly for those used to a Mediterranean or African climates. It remains unclear whether expansion into northern latitudes with lower winter temperatures required human physical adaptation, seasonal migration or developments in technology such as hunting, clothing, the use of shelters and the control of fire (Parfitt, et al., 2005; Parfitt, et al., 2010; Roberts & Grun, 2010). 1. Ashton, N. et al., Hominin Footprints from Early Pleistocene Deposits at Happisburgh, UK. PLoS One 9 (2) (2014). 2. Parfitt, S. et al., The earliest record of human activity in northern Europe. Nature 438, 1008-1012 (2005). 3. Parfitt, S. et al., Early Pleistocene human occupation at the edge of the boreal zone in northwest Europe. Nature 466, 229-233 (2010). 4. Roberts, A. & Grun, R., Early human northerners. Nature 466, 189 (2010).